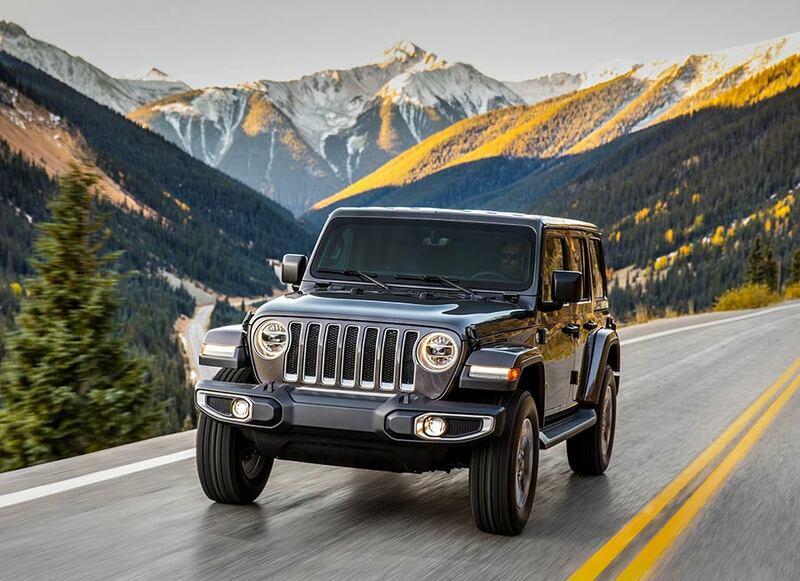 The all-new 2018 Jeep Wrangler – the most capable and recognized vehicle in the world – builds on its legendary history with an unmatched combination of off-road capability, authentic Jeep design, open-air freedom, advanced fuel-efficient powertrains, superior on- and off-road dynamics, and a host of innovative safety and advanced technology features. 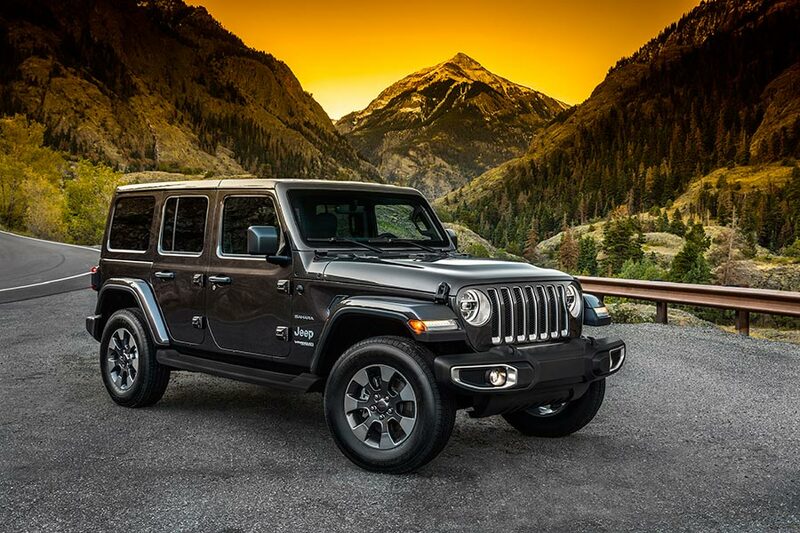 The all-new Wrangler is instantly recognizable as a Jeep, staying true to the original, yet it is better in every way – delivering even more rugged capability, more ride comfort, more fuel efficiency courtesy of several advanced powertrain options, more interior comfort, more safety and more technology. The Command-Trac 4×4 system features a two-speed transfer case with a 2.72:1 low-range gear ratio and next-generation solid Dana front and rear axles with a 3.45 rear axle ratio. On Wrangler Rubicon, a Rock-Trac 4×4 system features heavy-duty next-generation Dana 44 front and rear axles with a “4LO” ratio of 4:1. A 4.10 front and rear axle ratio is standard as are Tru-Lok locking differentials. The windshield’s rake has been optimized for improved aerodynamics and features a new four bolt design at the top of the windshield’s frame to allow the windshield to fold down quickly and easily. A new header bar now connects the A-pillars and stays in place even when the windshield is folded down. This allows the rear-view mirror to remain in place even with the windshield folded. New lightweight, high-strength aluminium doors now feature the Torx bit tool size stamped directly onto the hinge to eliminate guessing which tool size is needed to remove the doors. The heritage-inspired center stack features a clean, sculpted form that compliments the horizontal dashboard design and sports a finish dictated by the model choice. 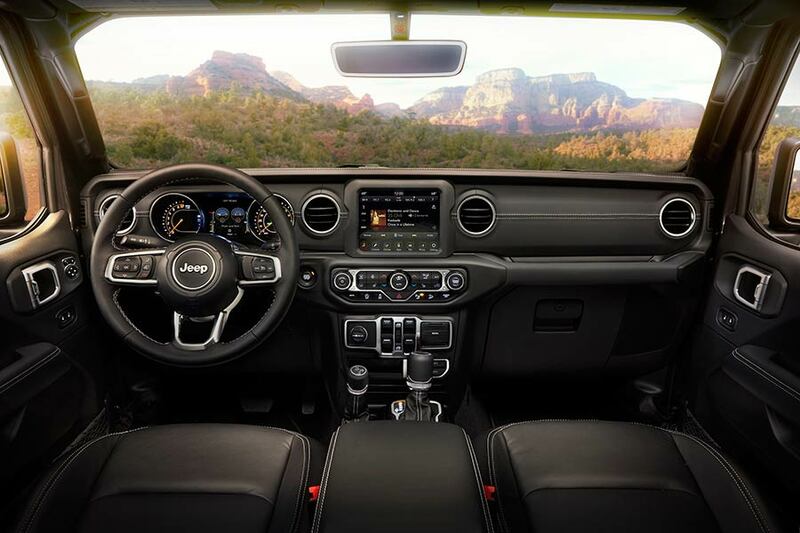 A hand-wrapped instrument panel features a soft-touch surface with accent stitching on Wrangler Sahara models. Functional features, including climate and volume control knobs, media charging and connectivity ports and Engine Stop Start (ESS) control are all sculpted for quick recognition and are easily within reach of the front-seat occupants. Inboard and outboard circular HVAC vents are surrounded by a platinum chrome bezel for a precise and premium yet rugged appearance with full functionality. 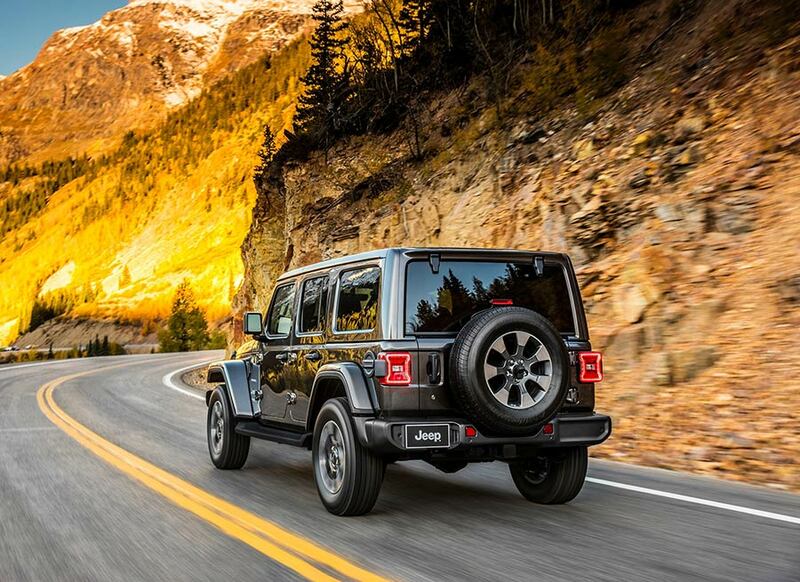 Jeep functionality and versatility are celebrated in the center console and distinguished with metal-plated accents. A redesigned center console houses the gearshift selection, transfer case and parking brake. Real bolts featured on the shifter, grab handles and frame the infotainment screen highlight genuine construction methods. The use of lightweight, high-strength aluminium closures, including the doors, door hinges, hood, fender flares, windshield frame and magnesium swing gate, help reduce weight and boost fuel economy. 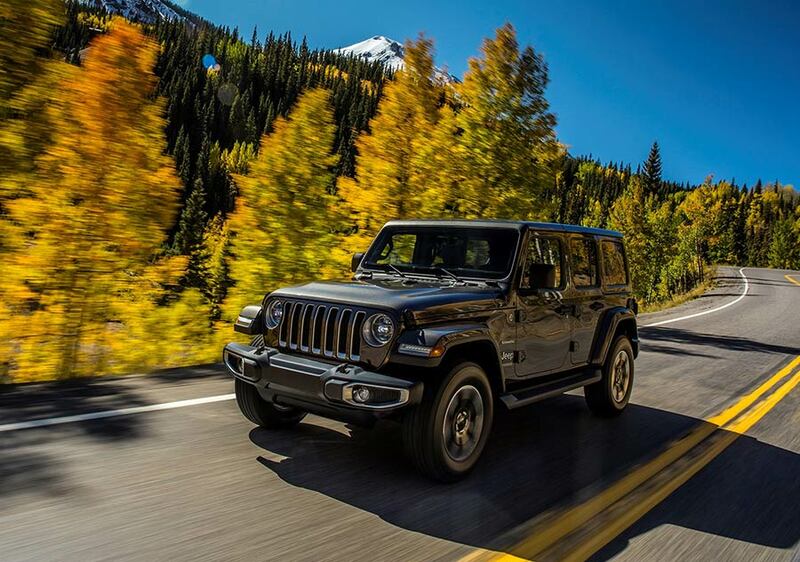 Other ways the Jeep engineering team looked to reduce weight included using hollow track and stabilizer bars, aluminum engine mounts and steering gear, and a larger, lighter master cylinder. The eTorque system’s hybrid functions include auto stop/start, electric power assist, extend fuel shut-off, transmission shift management, intelligent battery charging and regenerative braking. Both the engine and fuel flow may be turned off during stops, coasting, or when the engine is decelerating. Since 2006, the iconic Jeep Wrangler has been built in the south plant of the Toledo Assembly Complex, or what has also been known as Toledo Supplier Park, an innovative manufacturing project that engages supplier partners to help build the Wrangler body and chassis before being transferred to the FCA US-managed south plant for final assembly.